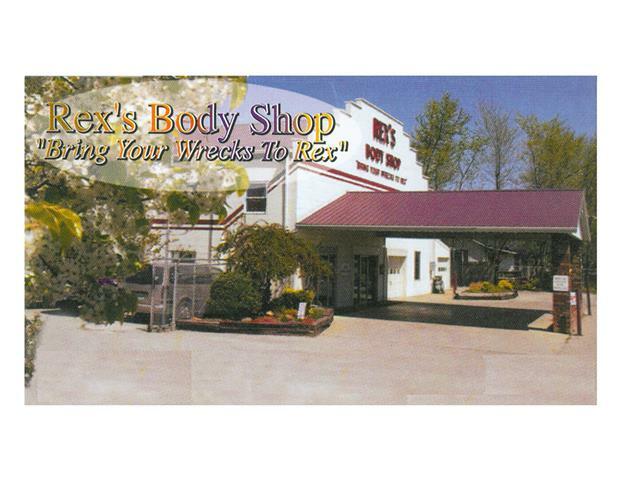 Rex's Body Shop – "Bring Your Wrecks to Rex"
"Bring Your Wrecks to Rex"
Rex’s Body Shop is a home owned, home operated company that opened August 4, 1974. Rex and Kathy Moyer, the owners, worked side by side in the business to make it the well-known reputable company it is today. Rex passed in 2005 and Kathy continues to manage and own the business. Rex and Kathy’s goals have always been to give their customers the highest quality of work and courteous service. This is evident in the repeat customers from generation to generation and the long term employment of their staff. Our estimating team has 95 years combined experience and our technicians have a combined experience of 79 years here at Rex’s Body Shop. We have an excellent working relationship with all insurance companies. We can help you with your claim to expedite the repairs on your vehicle as we guarantee our workmanship for the time that you own it. The staff at Rex’s Body Shop looks forward to doing business with you and helping to make your repair experience as painless as possible. Our ad says “Bring Your Wrecks to Rex”. When Rex passed away we added “Continuing Our Legacy of Excellent Service” as he would expect us to serve our customers in the way he taught us. And that’s what we do here at Rex’s Body Shop. My name is Doug Rhoades and I am parts manager at Thompsons Honda in Terre Haute. If you ever need Honda parts we would be happy to deliver to you. We give 25% discount. Our phone number/fax number is 812-232-1111. To reach me my extension is 127 or 129. We are currently looking for a Auto Body RefinishTechnician with at least 5 years experience in collision repair facility. Please email resumes and references.